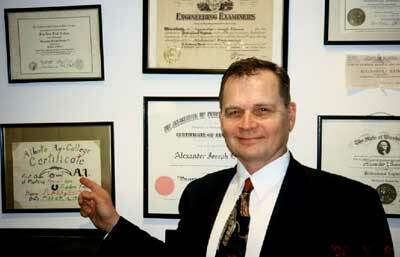 Alexander Boome Consulting Engineers, Ltd.
During the last twentyfive years we have completed eleven legal opinions. Ten of the opinions resulted in agreement on both sides with no further trial action. One opinion went to trial, because of other associated non technical matters. To date, all opinions were agreed to by both professional witnesses. The opinions have spanned a broad range of engineering topics, from those about construction practices, to indirect technical questions about cause of death. We review and analyze HVAC and plumbing design work and find out if it meets the professional standard of care for the area and at the time the work was completed. Often we review, documents, complete research about codes and standards in effect at the time of error, and design calculations. We investigate failures involving HVAC, plumbing and piping systems and can give you an objective and often scientific opinion regarding the cause and damages after careful research and analysis. We review documents, perform site inspections, perform detailed schedule analysis, research industry standards, prepare reports, prepare exhibits and provide presentations to assist you to resolve construction disputes involving changes, delays, damages and impacted labor efficiency. Cost estimating and cost analyses are prepared by us for your HVAC, plumbing and process piping construction, utilizing nationally recognized standards and techniques. We often prepare this for parties that are involved in a dispute. We prepare exhibits, and offer testimony based upon investigation, research, analysis and testing. We investigate and test HVAC and plumbing construction work that you think may be defective, substandard, or not in accordance with codes, standards, and/or normal practices. We can make a determination to find out if the work meets the standard of care for the area, and at the time the work was completed. Then we can prepare presentations, reports and exhibits if you need to go to that level of effort. Often, a Professional Opinion is enough - not always - sometimes maters must proceed. There are eighteen pages of a typical engagement agreement shown here in PDF format. © 2019 Alexander Boome Consulting Engineering, Ltd. All rights reserved.